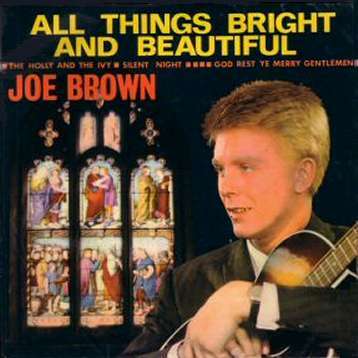 Joe Brown was actually born in Lincolnshire, but his upbringing in London's east end assured his acceptance as a genuine cockney. Joe had begun his musical career like so many of his generation as a member of a skiffle group. His natural ability with the guitar made him popular both with his audience and other musicians who wanted him to back them. Joe's big break came on Jack Good's third TV music show 'Boy Meets Girl', although Jack had actually found Joe as his previous show 'Oh Boy!' came to the end of its series. The programme was meant to portray the romantic side of rock and roll, but was later declared a big mistake by Jack Good himself. Although it may not have had the rock and roll credentials of his previous shows, 'Boy Meets Girl' was still very popular and hosted some of the best American acts to visit the UK during the late 1950s. Through his involvement with the show- and his great skill- Joe got the opportunity to play with artists like Eddie Cochran and Gene Vincent who he backed on tour. Joe was even invited to join Ronnie Hawkins band in the US, but fortunately he turned down the offer because it would have taken him away from his British girlfriend. You can argue that the Christmas carols on this EP (NEP 34026) were unusual material for a teenage rock and roller. Whatever you may think in that respect, it didn't prevent this seasonal offering at the end of 1962 from being one of Joe's best EP successes. Joe's chart career was slow to start, and it took him two years before he achieved a major placing. However, his skill with a guitar and his cheeky cockney humour made him a popular performer and a sought after backing musician. Although Joe's career in some respects mirrored that of his friend Marty Wilde he did not suffer quite the same level of decline as Marty during the late 1960s, even achieving a chart entry with the Lennon and McCartney penned 'With A Little Help From My Friends' during 1967. However, like Marty he married one of the Vernons girls (Vicki Haseman) and had a famous singing daughter, 'Sam Brown'. Joe's chart career is probably over (he last charted in 1973), but he is now loved as much for his personality as his music. It may even be that Joe's cockney humour has reduced his credibility as a serious musician, but he is undoubtedly one of the greatest (and certainly one of the tallest!) of the popular guitarists to have emerged from the 1960s.